If an alien civilization builds brightly-lit cities like those shown in this artist's conception, future generations of telescopes might allow us to detect them. This would offer a new method of searching for extraterrestrial intelligence elsewhere in our galaxy. Astronauts in orbit around the Earth often gaze down on a world lit at night by city lights. Now researchers suggest that scientists could detect alien civilizations from similarly bright lights. Science fiction has long imagined entire planets covered with cities. Examples include galactic capitols such as Coruscant from the "Star Wars" films and Trantor from sci-fi legend Isaac Asimov's "Foundation" books. Assuming that aliens need light to see at night much as we do, theoretical astrophysicist Abraham Loeb at Harvard University and astronomer Edwin Turner at Princeton University reasoned that extraterrestrial civilizations would switch on city lights during the hours of darkness on their world. "Both Ed and I were attending a conference in Abu Dhabi about novel ways to detect life, and we had a tour guide on a trip to the nearby emirate of Dubai who bragged that it was so bright at night that you could see it easily from space — that's what gave us the idea," Loeb told Astrobiology Magazine. On Earth, artificial illumination comes in two forms — thermal, in the form of incandescent light bulbs, and quantum, in the form of fluorescent lights and LEDs. The spectra or combination of colors from this artificial lighting would likely differ from natural sources of light such as volcanoes, and thus might serve as a lamppost that signals the existence of extraterrestrial technology and intelligent life. This new tactic is similar to traditional SETI (search for extraterrestrial life) strategies that hunt for alien radio transmissions. However, given how radio emissions from Earth have declined dramatically in recent decades due to the use of cables, fiber optics and other advances in telecommunications technology, a switch to looking for extraterrestrial light pollution might not be such a far-fetched idea after all, the researchers suggested. To see how feasible hunting for alien light beacons might be, first Loeb and Turner calculated how well it might work within our solar system. 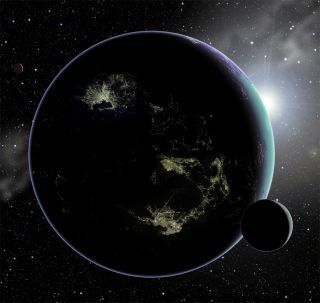 They began with an imaginary alien world in the Kuiper Belt, a region of our solar system beyond the planets that is likely home to a trillion or more comets and extends from 30 to 50 times the distance of Earth to the sun, or 30 to 50 astronomical units. The scientists calculated that a metropolis the size of Tokyo, one about 30 miles (50 km) wide, would be easily visible on a Kuiper Belt object about 50 astronomical units away from existing telescopes on Earth. A city like Tokyo could even be seen in the Oort Cloud reaching 1,000 astronomical units away, using the deepest image taken by the Hubble Space Telescope, the so-called Hubble Ultra Deep Field, Loeb said. As such, existing telescopes could spot artificially lit objects in the outer solar system — say, ones hurled away from distant stars or colonized by wandering alien civilizations. "There is the question of how likely it is that we have an extra civilization in the outer solar system," Loeb said. "My attitude is that if it's something we can look for, and it doesn't cost any extra resources, let's just do it. In the early '60s, a space telescope to view the universe in the X-ray spectrum was proposed, and the panel reviewing the proposal decided there was no point in doing it since the sun emitted very little X-ray emissions, and they thought we wouldn't learn very much about space. But now that we have X-ray satellites, we've learned the X-ray sky is extremely interesting, very rich in all kinds of X-ray sources we didn't expect, such as accreting black holes." Similarly, looking for artificial lights in the outer solar system could return unforeseen benefits. "There are other things we could discover from such a search," Loeb said. "We could learn about the shapes perhaps of Kuiper Belt objects, their reflectivity, and about binary objects." Physicist Josh Winn at MIT, who was also not involved in this study, added, "it's an intriguing and straightforward concept. A long shot, for sure, but fun to think about." As bright as the light of big cities might seem, currently Earth's night side is roughly 600,000 times dimmer than its day side. Existing telescopes could only see the night side of a world like Earth out to a distance of a little more than 1,000 astronomical units — that is, the edge of the solar system. "The closest star is 100 times farther than that," Loeb said. To see nighttime city lights as bright as Earth's on a world in the habitable zone of the closest star, you would need a telescope with optics at least 100 times wider in diameter than the Hubble Space Telescope's, he added. The next generation of ground and space telescopes could prove capable of detecting alien cities on worlds in the habitable zones of their distant stars, employing filters attuned to spectra of LEDs and other artificial light sources, the researchers suggested. However, to do so, the night side of those planets have to be comparable in brightness as their day sides, much brighter than we currently see in the differences between day and night on Earth. Another possibility involves looking for alien cities far away from the habitable zones of the closest stars, in their equivalents of Kuiper Belts. They would reflect less starlight since they are farther out, so any artificial light we detected from them would be more discernible. In that case, we could detect them with existing satellites if the nighttime lights were as bright as Earth's, Loeb said. A key assumption is that aliens need to rely on light at night just as we do, as opposed to being comfortable in darkness like many nocturnal animals on Earth. "Intelligent species might prefer the dark phases of their planets," Loeb said. Ironically, when Loeb was interviewed, a snowstorm had taken out the power at his home. "We're searching for lights that we don't have here right now," he joked. Loeb and Turner submitted their findings to the journal Astrobiology. This story was provided by Astrobiology Magazine, a web-based publication sponsored by the NASA astrobiology program.